Center City District Restaurant Week begins soon! From January 17-22 and 24-29, participating restaurants offer three-course dinners for only $35 and three-course lunches for $20. See a full list of restaurants and menus and make online reservations at CenterCityPhila.org/RestaurantWeek. While there, you can enter the contest for 52 gift certificates from Center City restaurants. 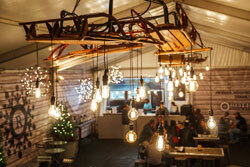 PLUS: During Center City District Restaurant Week, show your Restaurant Week receipt at the Rothman Institute Ice Rink in Dilworth Park for $1 off admission. Skaters can also enter to win gift certificates from participating restaurants. Who says Sips is just for summer? 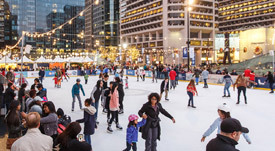 Every Wednesday in January and February, come to the Rothman Institute Ice Rink at Dilworth Park for Center City District Sips and Skate! From 5-9pm, take a few laps on the rink, then enjoy CCD Sips specials in the Rothman Cabin- $3 beer, $4 red or white wine and $5 Seasonal Mojito or Rosa Hot Toddy. For details, visit DilworthPark.org. Don't Just Toss That Tree! Start the New Year off sustainably by recycling your tree and holiday greens into mulch, which will be distributed to local parks and vacant lots. Bring your greens to designated collection sites on January 9. $5 per tree, $3 per wreath. For more information, including collection sites, go to GreenLimbs.com. GayBINGO! raises money for the nonprofit AIDS Fund. It's the fabulous, irreverent, campy, wildly-popular monthly event that's entertained Philadelphia audiences for 18 years. Each game has its own theme. Come to the Gershman Y on January 9 for Divas Las Vegas and let it ride. What happens in GayBINGO!, stays in GayBINGO! South Moon Under is a fashion-forward company that offers an eclectic mix of men's and women's clothing, swimwear, accessories, jewelry, and gifts for the home. This month you can take an additional 25% off all sale items. InterAct Theatre has made a new home at The Drake building at 1512 Spruce Street. They're kicking off their season with a new production, #therevolution. The show runs from January 22-February 12. Century 21's everyday savings just got sweeter and just in time for you to create a new look for the New Year! Now through January enjoy up to 75% of your favorite designer brands at all Century 21 locations.